Traditional cottage pie with a rich meaty sauce, topped with creamy mashed potato, crisped up to golden perfection. Check out my tip for ensuring also get a jug of delicious gravy to pour on top. When Chris and I were first dating (over 15 years ago! ), we had a tiny little flat. One night I made us cottage pie for dinner and we put the leftovers in the fridge. The next morning, I found him frying up the leftovers in a pan – in a big mixed up mush. He fried it for ages – till it was crisp all over. Then he placed it between two slices of buttered bread and smothered it with ketchup. He’s pretty well-rounded when it comes to food and cooking. But that was definitely one of the weirder moments, watching him eat that ketchup covered monstrosity. He still does it now. It’s a thing. If we have the cottage pie on the table, anyone looking to scoop out the last portion is given a stern look. That’s Chris’s weird breakfast portion. We start by placing the potatoes plenty of cold water. Bring them to the boil, then simmer for 15 minutes and drain. 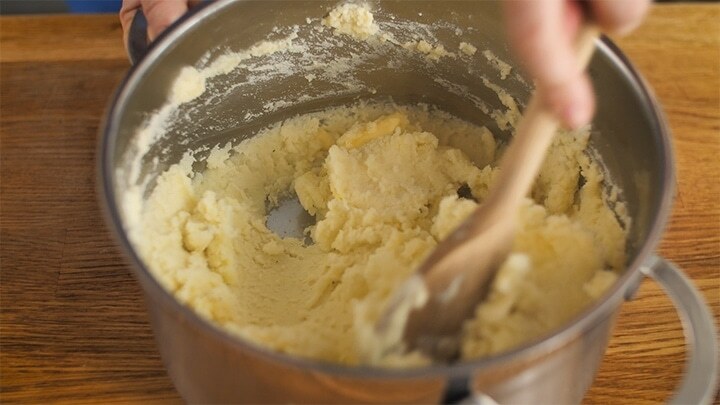 I use a potato ricer (<–affiliate link) for perfect lump-free mashed potato. For some reason, I’ve never been able to manage it with a regular potato masher. Add salt, pepper, a good dollop of butter and double (heavy) cream. Mix it all together (adding more cream if needed) until it’s thick and creamy. Whilst the potatoes are boiling, I start on the base. Fry up onions, celery and carrot in a little oil. Add the minced beef plus salt, pepper and a good dash of Worcestershire sauce. Once the meat has browned, add in beef stock. **Pro Tip** I add in a lot more stock then you think you might need – this is so you have enough liquid for gravy later. Bring to the boil, then simmer gently for about 10 minutes. 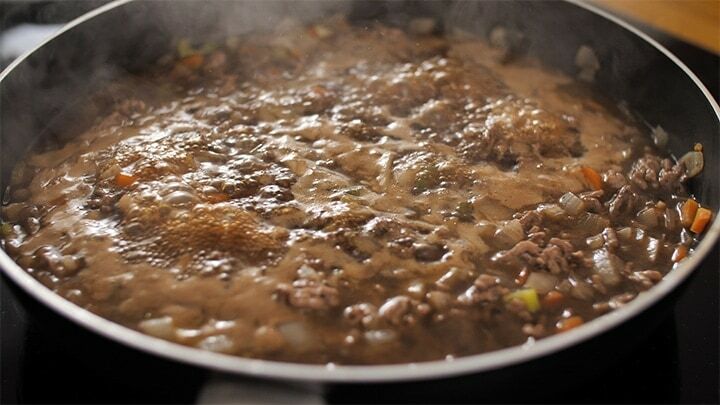 After 10 minutes, stir in a cornstarch slurry to thicken the sauce, then use a slotted spoon to scoop out the meat and vegetables, leaving the majority of the liquid behind in the pan (don’t worry, there’ll still be enough gravy in the pie itself if you use a slotted spoon). This will be your gravy. Spoon the mashed potato on top of the meat in blobs. **Pro Tip** Spooning it on in blobs will help you get an even coverage and help prevent the meat getting mixed in with the mash when you spread it. Then use a fork to join up the blobs and cover the meat. 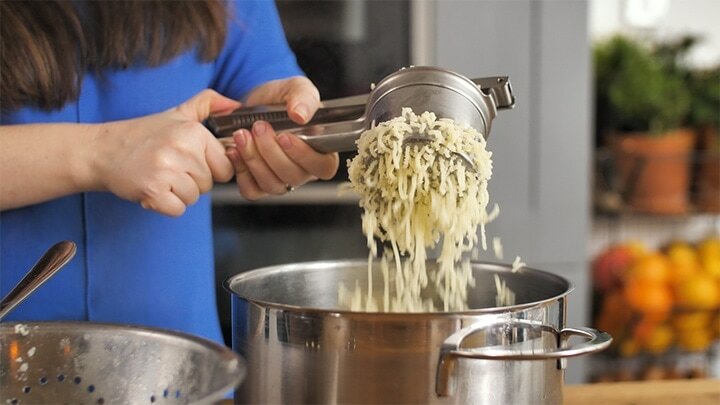 Use the fork to ruffle up the mash too – the more texture you have, the more crispy bits your mashed potato will have. Place in a preheated oven at 200C/400F for about 20 minutes, until the top is golden brown. Just before it’s ready, reheat the gravy and serve it with the cottage pie and some green veg. I love serving it with some picked red cabbage or beetroot too. 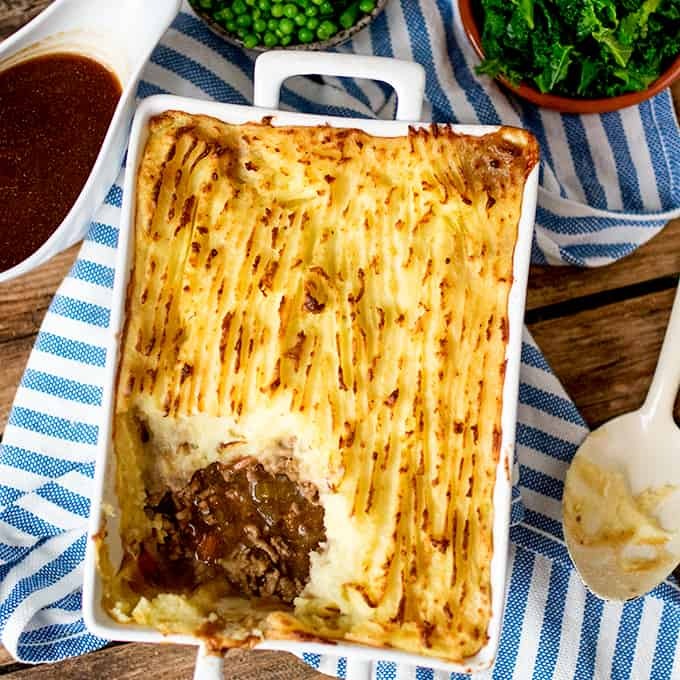 If you love cottage pie, why not try my Shepherd’s pie version with lamb mince, or Colcannon topped sausage bake. Yes – this is already a gluten free recipe – providing you use gluten free stock. 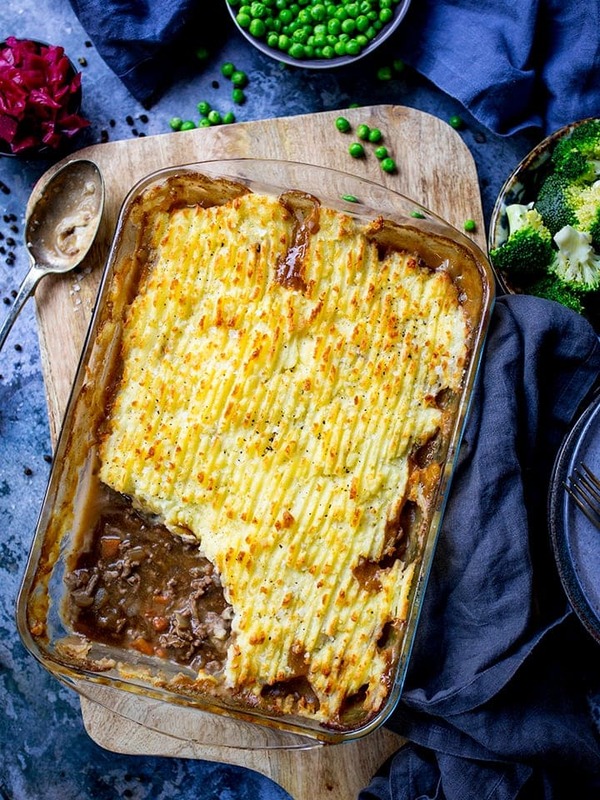 Yes, make the cottage pie right up to the point before you put it in the oven. Then quickly cool, cover and refrigerate, along with the gravy. It should be fine in the fridge for up to a day. Place in the oven straight from the fridge, for 20-25 minutes at 200C/400F until the potato is golden brown and the meat it starting to bubble up at the sides. Heat the gravy in a pan until piping hot. 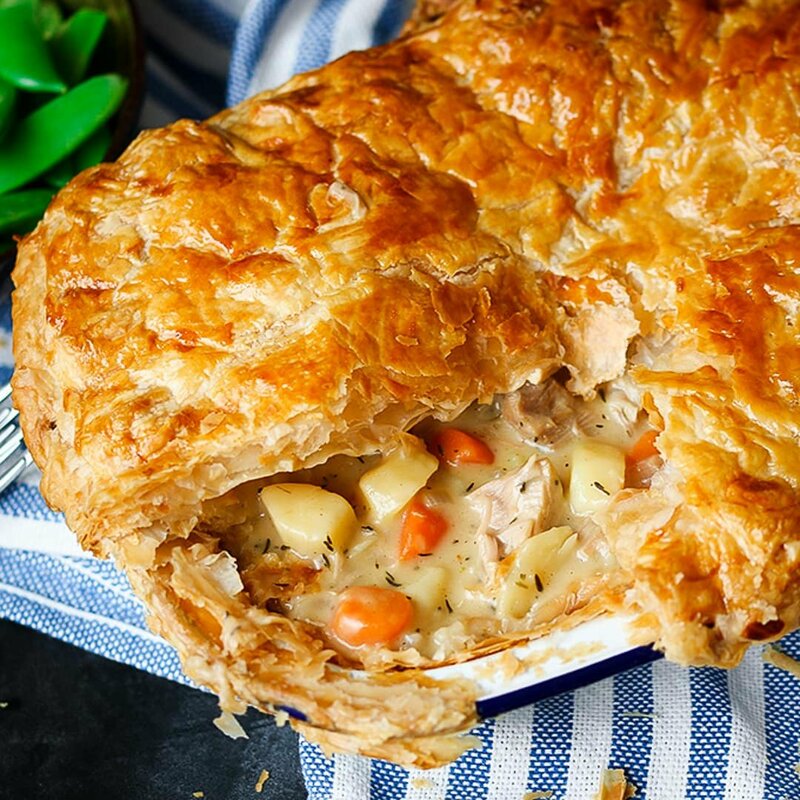 I find the mashed potato can be a little watery after freezing, but so long as the pie is fully defrosted before reheating, the pie should be fine after cooking and crisping up in the oven. As above make the cottage pie right up to the point before you put it in the oven. Then quickly cool, cover and freeze, along with the gravy. 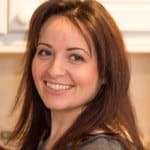 Defrost in the refrigerator overnight (ensure it’s fully defrosted throughout before reheating), then place in the oven for 20-25 minutes at 200C/400F until the potato is golden brown and the meat is starting to bubble up at the sides. 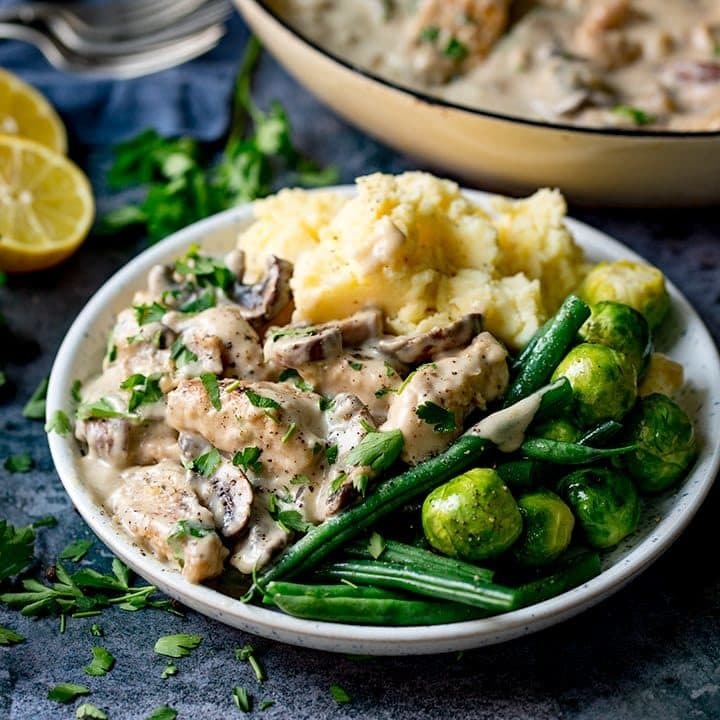 Heat the gravy in a pan until piping hot – it may need a splash of water and a whisk to remove any lumps (or you could sieve it). Can I make a vegetarian version? Yes. If I’m making a vegetarian version, I use quorn mince (or similar alternative) with lots of very finely chopped mushrooms. Use a tasty vegetarian stock – such as Knorr vegetable stock pots. You may need to adjust the seasoning, as some vegetable stocks can be quite salty. 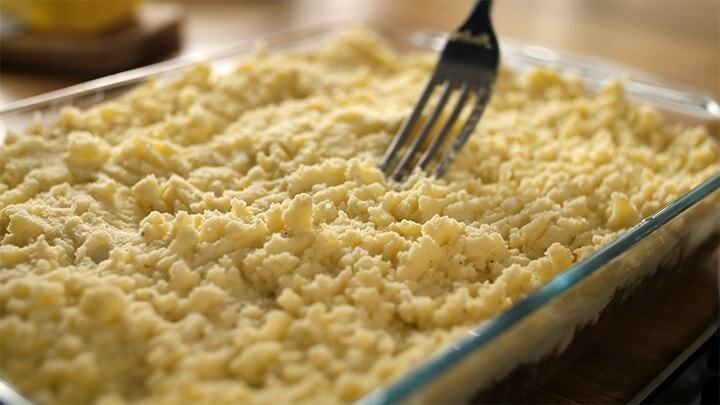 Top with cheesy mash – add 150g (1 ½ cups) grated cheddar to the mashed potato. Add bacon bits to the mashed potato. Use sweet potato instead of regular potato. Add in 1 tbsp curry powder, ½ tsp ground coriander, 1 tsp ground cumin and a pinch of chilli flakes when frying the mince for a spicy version. This tastes even better with sweet potato mash on top. Traditional cottage pie with a rich meaty sauce, topped with creamy mashed potato, crisped up to golden perfection. Place the potatoes in a pan and cover with cold water. Bring to the boil and simmer for 15 minutes. While the potatoes are cooking, preheat the oven to 200C/400F. 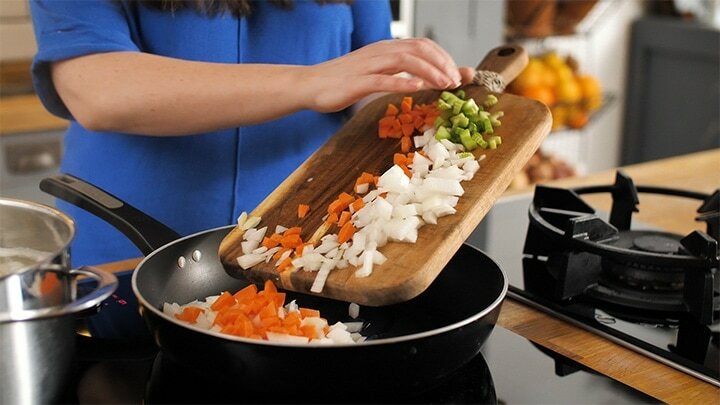 Heat the oil in a large frying pan and cook the onions, celery and carrot on medium heat for five minutes until they start to soften. Add the minced beef and cook until browned – breaking up any pieces as you go. Add in half the salt and pepper, the Worcestershire sauce and stock (see pro tip 1). Simmer for 5 minutes. By this time, the potatoes should be cooked. Drain the potatoes and mash using a potato ricer. Add the cream, butter and remaining salt and pepper and mix together. 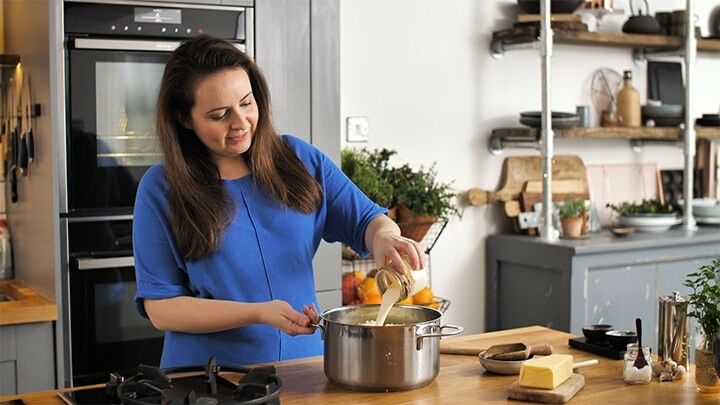 Mix the cornflour (cornstarch) with three tbsp of cold water and stir into the simmering beef mixture to thicken the sauce (you may need to add a little more if you like it thicker). Turn off the heat and use a slotted spoon to scoop out the beef mixture and place into a 7”x 9” (18cmx23cm) baking dish. This should leave most of the gravy behind in the pan. Top the beef with the mashed potatoes (see pro tip 2), and flatten out with a spoon. Rough up the top of the mash with a fork (so you get nice crispy bits). Place in the oven for 20 minutes until the mashed potato is golden brown. 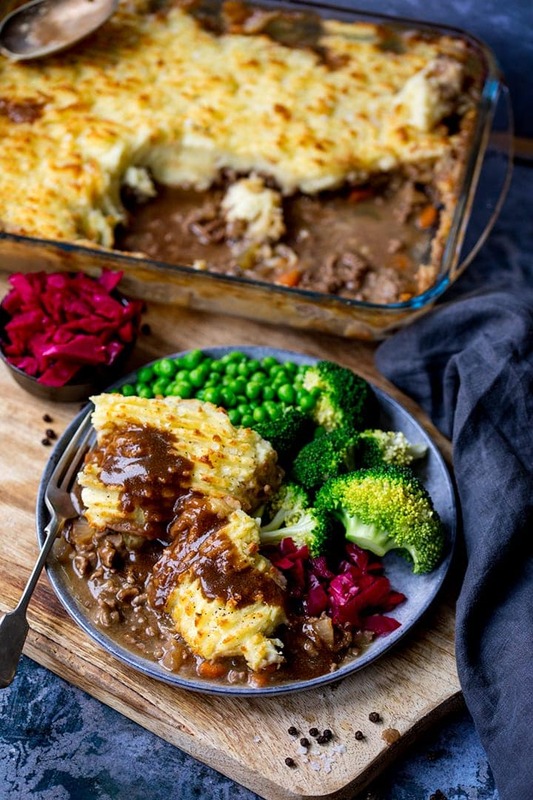 Heat up the gravy, then serve the cottage pie with the gravy, green veg and some pickled red cabbage. **Pro Tip 1** 2 1/2 cups (600ml) sounds like a lot of stock but this amount is needed so you have enough liquid to make into gravy later. 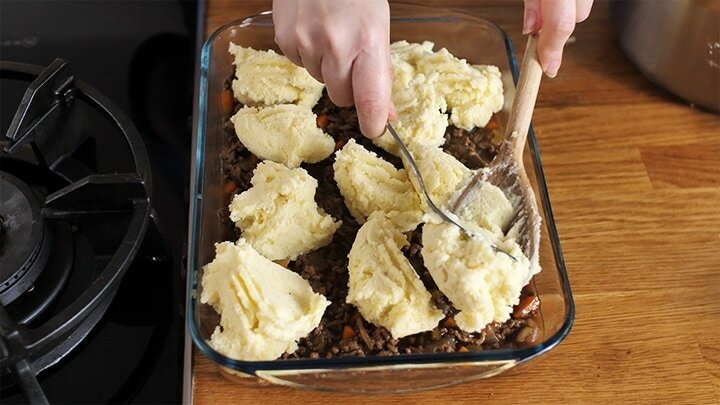 **Pro Tip 2** Spooning the mashed potato on in blobs will help you get an even coverage and help prevent the meat getting mixed in with the mash when you spread it. You simply need to join up the blobs. Nutritional Information is per serving with gravy, but not including the serving suggestion of green vegetables and pickled red cabbage/beetroot. Very Good. My family loved it. Thanks. Looks good, I take your point about not making the meat portion dry I avoid this and make the gravy last to a suitable consistency, a little thing if dry. I am a suckered for gravy and make onion gravy with extra freedom fine chopped onion fried to near burnt in oil and a little brown sugar, yum yum. This is REALLY tasty and yes I did have some fried up for breakfast after we finished shooting the video. 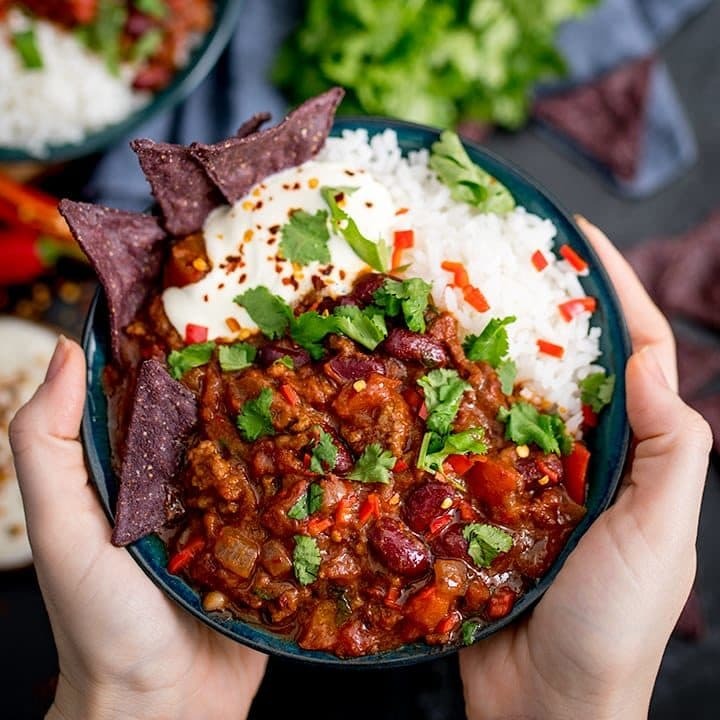 One of my all time favourite comfort foods! 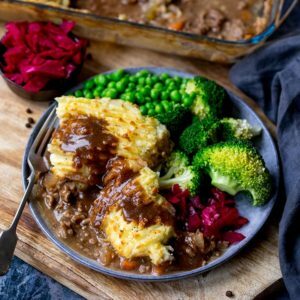 Cottage pie is one of our family favorites, but I’ve never thought to separate the gravy from the meat mix, and mine generally gets really sloppy…. I’ll definitely be trying it this way next time! !